After the visit in museum we made a round trip through the neighbouring towns. 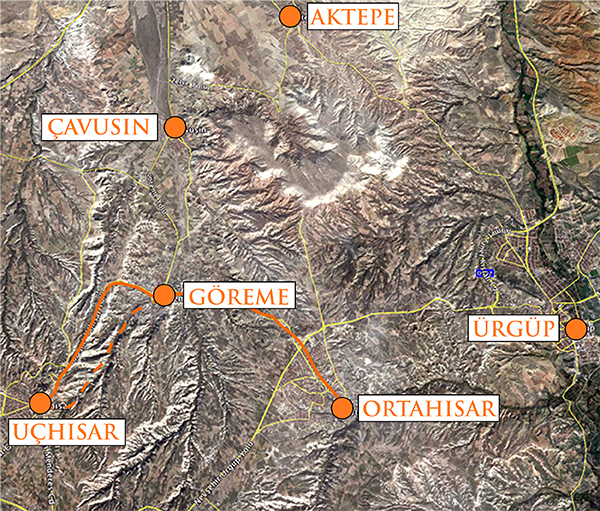 First we visited the town of Ortahisar. It is named after a 90 m high castle-like rock formation that is located there. Ortahisar means `middle castle`, which comes from its central location in the region. J. Praszkier photo. 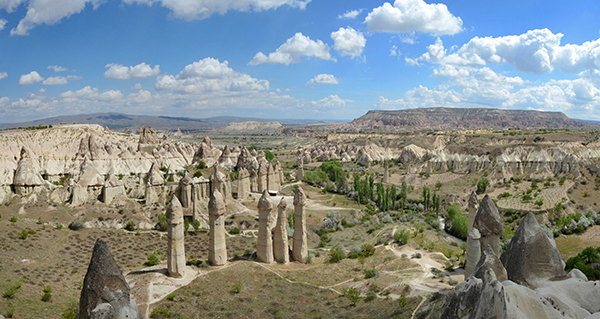 Ortahisar town is named after a 90 m high castle-like rock formation that is located there. 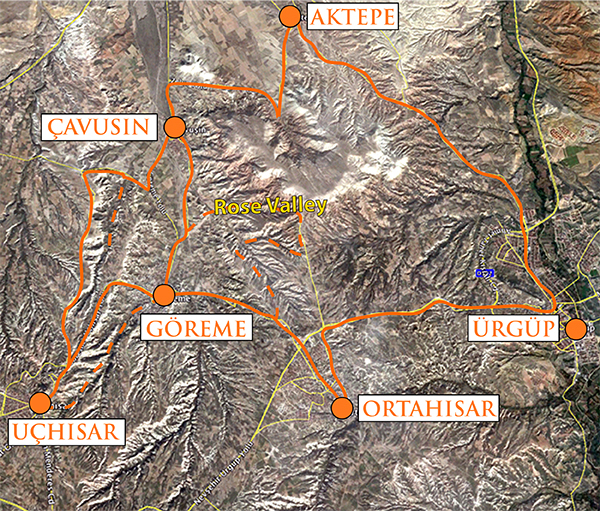 Ortahisar means `middle castle`, which comes from its central location in the region. J. Praszkier photo. We continued our evening trip to Pasabagi through Urgup and Aktepe. On the way we stopped near Urgup to take the photos of some nice rocks - note the `caps` on the top of these formations, these are harder rocks that protect what is beneath them, thanks to that the erosion creates these interesting shapes. J. Praszkier photo. On the way to Pasabagi. J. Praszkier photo. 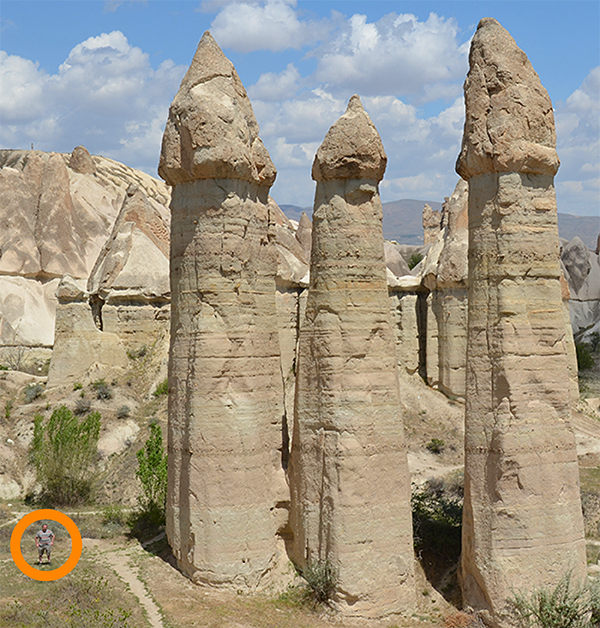 Pasabagi - a number of very nicely shaped tuff cones standing right next to the road. This site is also called Monks Valley. A chapel dedicated to St. Simeon and a anchorite`s shelter is built into one of the fairy chimneys. J. Praszkier photo. One of the rocks resembling a camel. J. Praszkier photo. Pasabagi, the Monks Valley. J. Praszkier photo. Pasabagi - Monks Valley. A chapel dedicated to St. Simeon and a anchorite`s shelter is built into one of the fairy chimneys. J. Praszkier photo. View from the church in the Monks Valley. J. Praszkier photo. 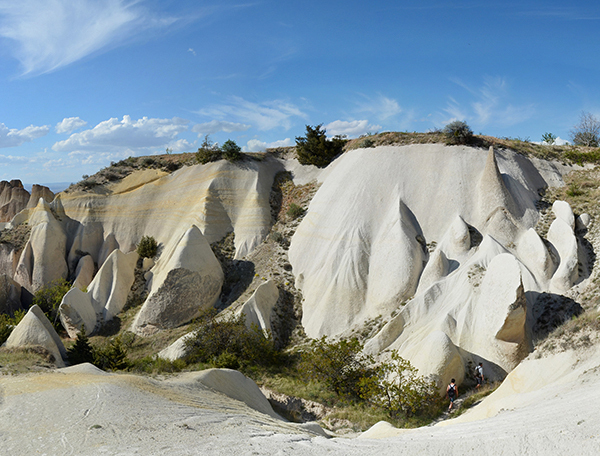 We went back to Goreme through Cavusin town. Sunset in Cappadocia. J. Praszkier photo. That evening we ate dinner in a restaurant carved in the rock. J. Praszkier photo. It looked great and felt interesting to ate in a place where people lived such a long time ago. J. Praszkier photo. View to Uchisar from our hotel. J. Praszkier photo. 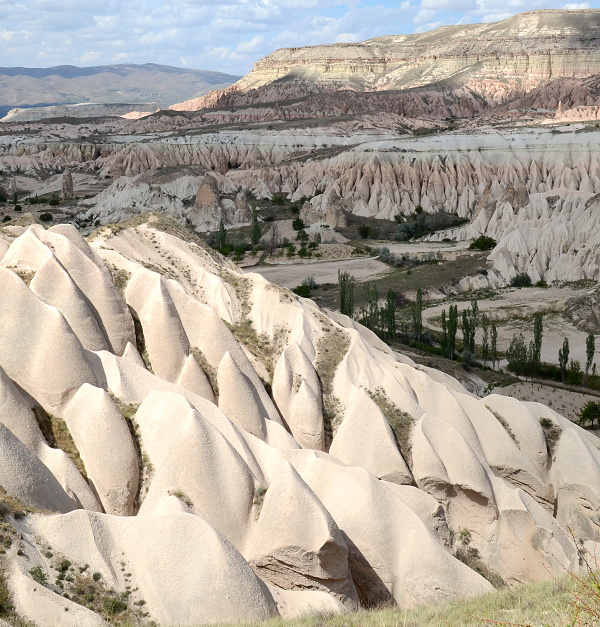 We spent the next day walking in the valleys - the first one was the Love Valley. Love Valley. J. Praszkier photo. Love Valley. Are you wondering where its name comes from? J. Praszkier photo. Juice-shop in the Love Valley. J. Praszkier photo. Having tea in the Love Valley. J. Praszkier photo. Love Valley and a small `restaurant`. J. Praszkier photo. Love Valley - Tom used as a scale. J. Praszkier photo. Tom in the Love Valley. J. Praszkier photo. After the walk we visited Cavusin town. The last houses in the rock pictured above were still inhabited in the second half of 20th century. After this `tower block` collapsed living inside the rocks became forbidden. J. Praszkier photo. Ancient churches and chapels are really abundant in Cappadocia and many of them are not protected as well as one might think they deserve to be. Here trash can in front of the chapel in Cavusin. J. Praszkier photo. In the vicinity of Cavusin. J. Praszkier photo. Later we drove to the start point of another hike - the Red Valley. Google Earth. Red and Rose Valley were the ones we liked most. J. Praszkier photo. View to the Red Valley. J. Praszkier photo. 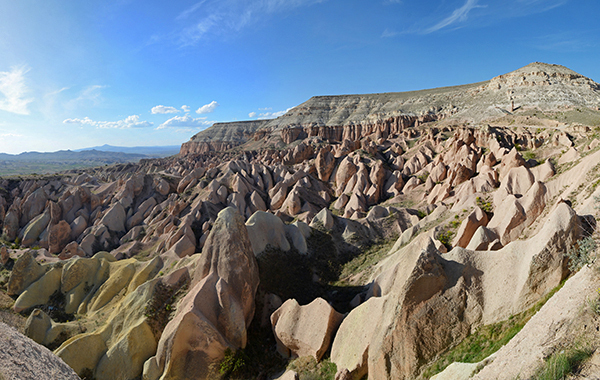 View to the Red Valley and Aktepe Mountain. J. Praszkier photo. Tom in front of the Aktepe Mountain. J. Praszkier photo. View to Aktepe Mountain and surrounding valleys. J. Praszkier photo. Walking in the Valley. J. Praszkier photo. 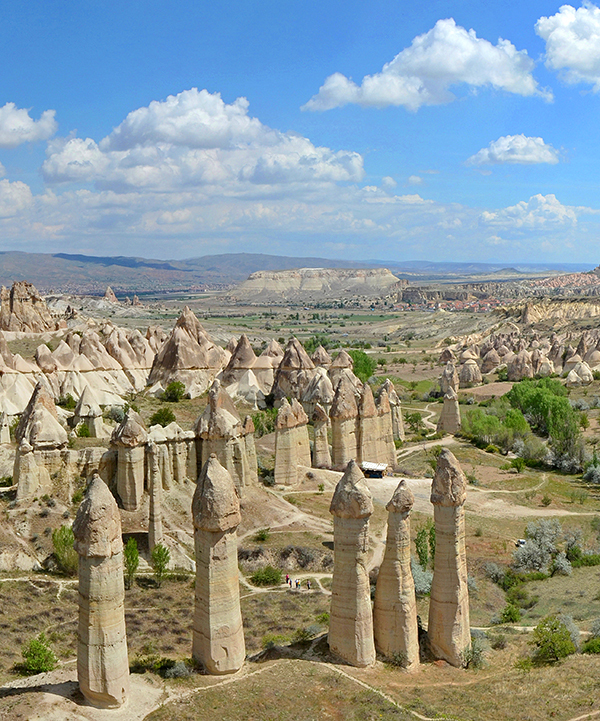 Pigeon houses are found throughout Cappadocia. They were carved wherever space allowed including the collapsed churches. The pigeon`s droppings were very valuable as fertilizer, before the chemical ones were invented. However, some farmers still maintain their pigeon lofts because they think pigeon`s fertilizer gives the fruits much better taste. J. Praszkier photo. 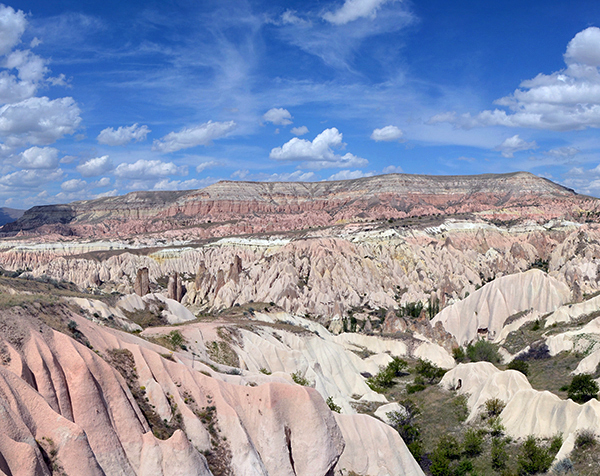 Pigeon houses are found throughout Cappadocia. They were carved wherever space allowed including the collapsed churches. The pigeon`s droppings were very valuable as fertilizer. Some of the lofts are located really high and have small carved steps leading to them. J. Praszkier photo. Walking in the Red Valley. J. Praszkier photo. A nice place to have rest. J. Praszkier photo. Interesting toilet and washstand. J. Praszkier photo. Small resting place in the valley. J. Praszkier photo. Walking in the valley. T. Praszkier photo. And when we went up the Red Valley we went down again through the Rose Valley. The viewpoint - Rose and Red Valley in the background. There are a lot of tourists` groups coming everyday to see the sunset. J. Praszkier photo. One of the churches hidden in the valley. J. Praszkier photo. Inside the church. J. Praszkier photo. Inside the church - note the scratched faces of figures - it is not allowed in Islam to pictue people, especially saints and god. J. Praszkier photo. Walking in the valley, we were happy someone installed this rope. J. Praszkier photo. One of numerous partly collapsed churches. J. Praszkier photo. 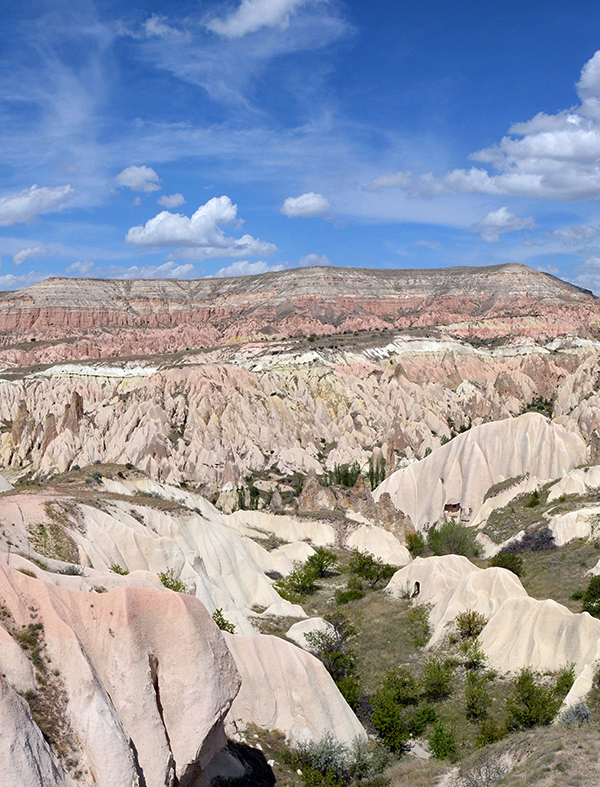 It was a long walking day, finally we arrived back to Goreme. And the last day of our trip comes. I got up at 4 AM to take part in baloon trip over Cappadocia. J. Praszkier photo. There was a heavy wind and the trip was almost cancelled, fortunatley we eventually took off. J. Praszkier photo. Taking off was a little bit scary. J. Praszkier photo. There are countless baloons in the sky every morning. It is a great opportunity to see the valleys from a different perspective. J. Praszkier photo. Baloons in front of Cavusin "rock tower". J. Praszkier photo. Baloon trip. J. Praszkier photo. Baloon trip - view to the Love Valley. It looks very different from above. J. Praszkier photo. Baloon trip - view to the Love Valley. J. Praszkier photo. Baloon trip - view to the Pigeon Valley. J. Praszkier photo. Baloons start going down almost in the same time. J. Praszkier photo. It looks very funny when all the ballons` transporting cars appear from nowhere driviing very fast to be in time for landing. Of course the pilot can not plan in advance where he will land exactly, all depands on the wind. J. Praszkier photo. The flight is over. J. Praszkier photo. We landed with no problems. J. Praszkier photo. Packing the baloon. J. Praszkier photo. Toast at the end of the trip. J. Praszkier photo. After I got back from the baloon trip we had to drive to the airport. We flew back home through Istanbul where we had enough time to enjoy delicious Turkish ice cream (called dondurma) for the last time.